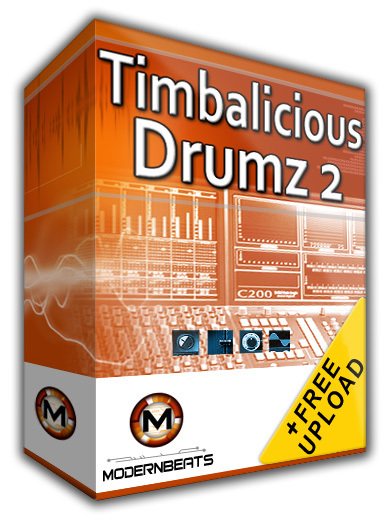 Download Timbalicious Drumz 2 - If you've been desperately searching for a drum library that is accurately modeled in the style of legendary hip-hop music producer Timbaland, then your search is now over - We present to you volume 2 of our acclaimed "Timbalicious Drumz" series! Now is your chance to acquire 3 volumes of high-quality drums, each modeled after Timbaland himself. Timbalicious Drumz 2 comes stuffed with 72 Timbaland-style kicks, 60 cold snares and rimshots, and 60 percussion elementz to add perfect sparkle to your rhythms. Each of the 6 multi-format presets included in the set contains 12 boomin' kicks, 10 punchy snares, and 10 sizzlin' percussion samples for over 190 samples total! Download the whole Timbalicious Drumz collection (Volumes 1, 2 & 3) and collect the complete total of 216 kicks, 180 snares, and 180 percussion samples to start making beatz made of titanium.